The links in this file are updated on a monthly basis. Check back to get the latest file. Actually, a lot of the videos on my channel are from you. The process of coming up with video ideas starts off chaotically, but ends up quite organized. It generally starts off with Youtube, and one of you commenting on a video of mine, asking a question, and then me realising that the question could be best answered with a video. 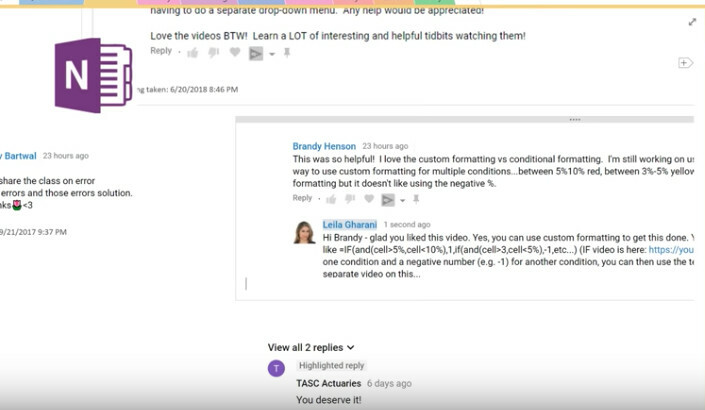 I take a screen clipping of the comment and, as I generally have my OneNote open in the background, I go to my YouTube section and I paste that in the page “Video ideas to file”. Once I get some time for filing, I add a tag to this and then I cut the idea and I paste it into “Filed ideas”. The moment I do that, I add that idea to my Excel file. I have a tab called ideas, and I make one row per idea, and I add the tag to it. 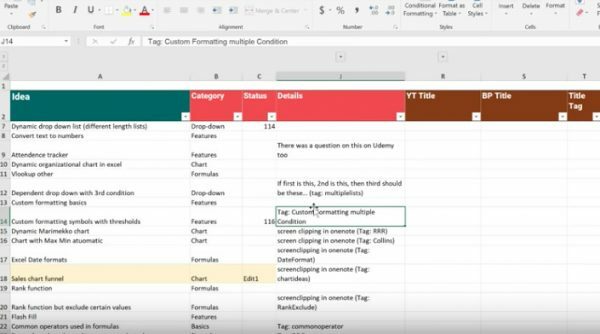 When I come to create this video, I can look up the tag on my OneNote and see the screen clipping, to get more information about what the person wants to see inside the video. Sometimes I mention the person’s name, sometimes I don’t. It might be because the question was raised by many people and I just take a sample, but basically that’s the process of coming up with ideas. Now, let me show you how you get to the FREE Excel Tutorials mentioned in the title! 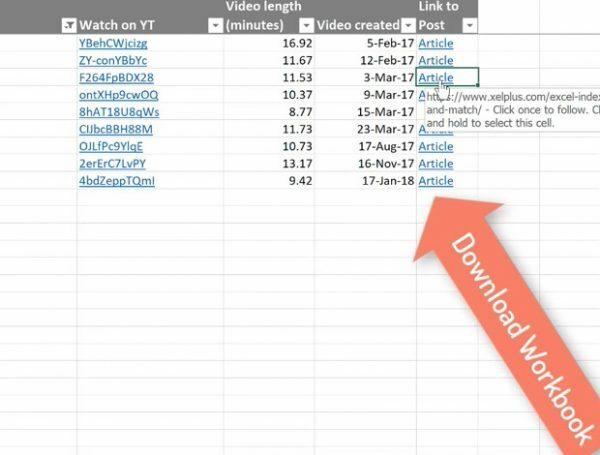 If you scroll down to the bottom of this post, you’ll find a link that takes you to an Excel Workbook where you can see the list of all the videos I have on the my YouTube channel up to now. The good thing about this is that you can search for a phrase, and filter by topic (it’s much easier than searching directly on YouTube). Let’s say you want to learn more about the INDEX formula. This is going to give you all the rows that include the word INDEX. 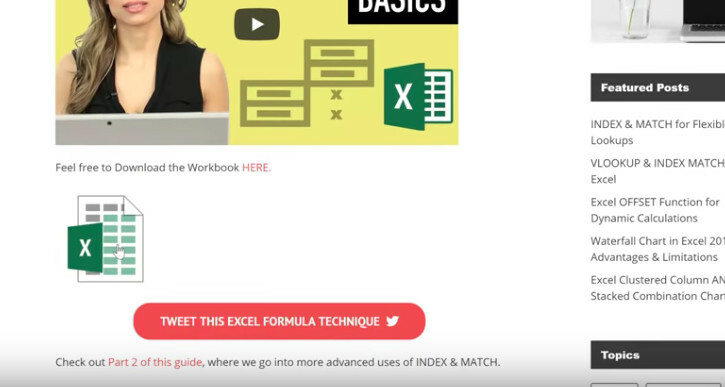 Now let’s say you find this one interesting “How to use index and match”. You can click on the link which takes you to the YouTube video, you can see the video length, the date it was created and a link to the article. If you’d rather read about it instead of watching the video, or you want to download the workbook to practice along with me, click on the article link. This will take you to my tutorials page on this site. You can follow the instructions, or just download the workbook at the bottom of the blog post. 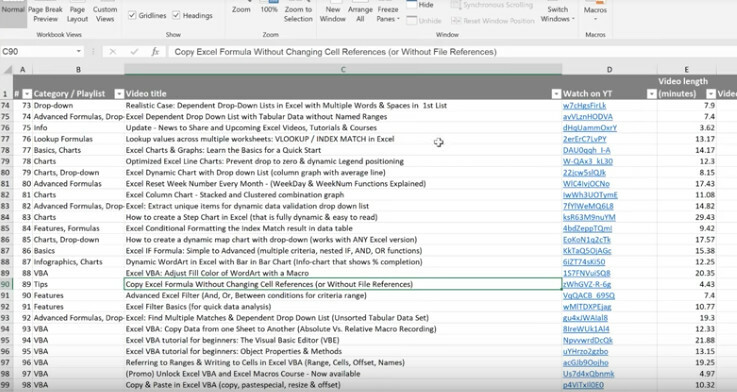 If you’re curious how the filter technique worked with the wild cards (*) I have a video on Excel filter basics and advanced as well. Check them out if you want to learn more. I hope this helps you find useful videos and learn new topics. If there’s a topic there that you didn’t know I had and you found it helpful, let me know in the comments below. Also, if there’s a topic that I don’t have yet and you’d like me to make a video on it, let me know in the comments below too. You know what’s going to happen now to that comment! Feel free to Download the Workbook HERE. Learn when you like, where you like. Learn anytime that fits your schedule. I have been following your excellent “Excel Hash” video and trying to replicate the elements you highlighted. For some reason the frequency formula will not work. Instead of generating the value re each of the bins it just returns the value of the 0 bin for each of the other bins as well. 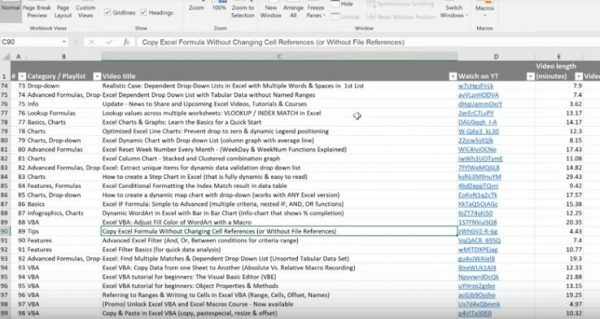 Have you made the excel file available anywhere so that I can download and see what it is that I am doing wrong? One reason could be this: When you write the Frequency function you need to highlight the cells where you want the result of the frequency function to be first. For normal formulas you just click in a cell and type in the formula, but here you actually need to highlight all the cells that should have the result in them (in this example: I2:I6. Then go to the formula bar and type in the formula – then press Control + Shift + Enter (not just enter but Ctrl + shift + enter). Your formula should work then. I have been following your youtube channel lately and was amazed from your video tutorials and ideas. I have been struggling with a filtering issue recently and no one was able to find a good solution for me. The main problem is filtering by dates that are in different formats. I can provide a sample spread sheet and detailed explanation. I will be glad to get your help. Specifically, will it be in Office 2019? Will there be an add-on for earlier versions? Also have to tell you that I discovered your YouTube videos a few weeks ago and you are amazing. Combining technique with graphic design with exceptional presentation skills. I’m a fan! Hi Lawrence, unfortunately, it will not be part of 2019 Excel. I think it was too late to include it in there. It will be part of Office 365 rolled out as an update. I have been a big fan of excel and always used to think that i need to learn more. Over the last few weeks i have been watching some of your videos in the quest to get better with the usage of excel. Your videos make the understanding of those functions simple and the applications of those functions that you bring about is absolutely brilliant. Thanks for sharing such informative stuff in such an easy to understand manner. Presently i am wondering if should take a course in excel and the vba course really looks interesting to me, however i am not sure if it is the right time for me get there now as i am still in the learning mode w.r.t the various functions and there utility. Wonder if you could have some suggestion here. Hi Samir – thank you for your support of my videos. I’m glad you find them useful. I don’t suggest learning VBA yet – I’d say you wait until you feel you have a good foundation in Excel first and then to start to dig in VBA. I have an Excel basics playlist on my channel you could start from. 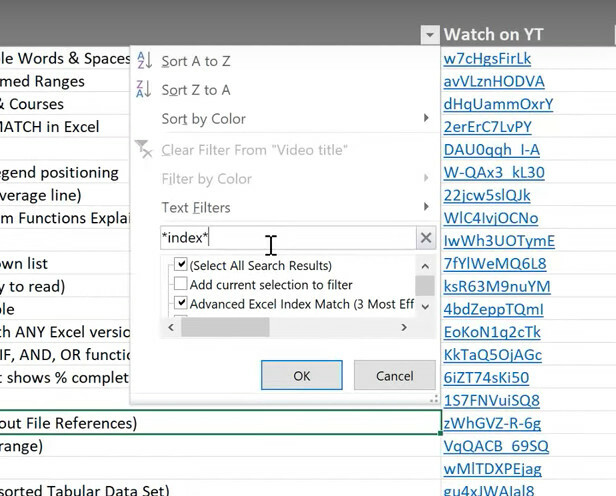 I’ll also create an Excel basics crash course soon on my site. Hi Faissal – this is the name of the Demo book I have inside my paid visualization course. Please download this from inside the course, you’ll see it as a resource. Thank you, thank you, thank you so very much for your training videos, I greatly appreciate your help. I have made a few purchases on Udemy to further my Excel proficiency. Thank you Kim for your support! Wish you nice holidays and all the best for the new year. Good evening, I watched most of your post in about excel to learn. Thank you for teaching everyone. I have one request, could you please make one post to short all absent, sick or present on roster according to the date Drop Down list in such a way that when we choose one category it display the persons of that day in roster. I mean when we choose absent all absent people on that day should be displayed. I will send the attachment of format on next text. Thanks Chandra – Sure – I can add an example for that. 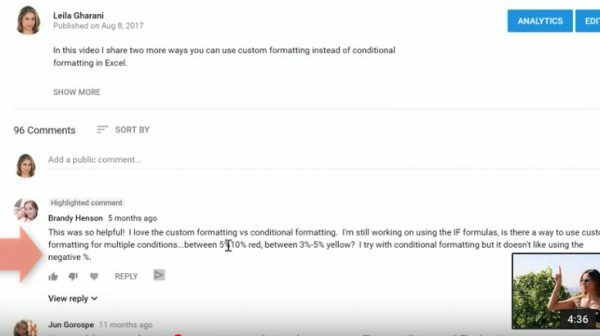 For now, you can use the same method shown in this video. Soon with Office 365 it will be a much much simpler formula. I never get tired watching your videos and your channel is my go-to guide when I need a quick refresher on an excel problem. I just love the way you explain things so they make sense. You are a beautiful and smart woman and I am looking forward to learning much more from you. I just found out about your youtube videos a couple of months back but only subscribe to your channel a few days ago. I am a middle school teacher and have been struggling to round up the scoresheet result. In my scoresheet, I have to give the final result (letter grades) in one specific result. I have been using the concatenate formula to roynd up the final result, example, a student got a letter result of 5A 3B and 1D but the result that appeared on the final result is 5A 3B 0 1D 0 0. Now how do I can get the final result only, that is 5A 3B 1D. Your workbook of tuts is such an incredibly smart thing to do. I’m so glad I subscribe to your channel. As my father used to say, “organization is half the battle”. And so as not to leave you hanging, execution is the other. I can’t wait to see what 2019 brings. I love to learn. Thank you for being such a marvelous, thoughtful teacher. Thanks in advance for your free tutorials, I use a lote of them, bur sometimes I can’t find the video. Can you send me a link to download all of your tutorials at the same time? First of all, I have been watching many of your videos and you are one of the kind with the way you explain. I am a MOUSE expert and have been teacher in this many years ago. My heart is with excel all the way. One of my hobbies is cooking, and for many years i want to collect my recipies. Some month ago I started, and i started watching our videos.I know i can do this in access or VB, but I want to do it in excel. Ican do some programming in VB to make things happen but not all. I know i can do it all with formulas. I have tried VLOOKUP, HLOOKUP INDEX and MATCH, but I dont get the function of it..I know it is my definition in the formula that is wrong, but I dont know what. Why I do this? I have been trying so many recipies program but there is always some thing wrong, eks. you can not do anythhing with the language… If I get this to work my way I wil let it go for free so any one can use it and in an easy way make it fit theyr need. Intresting? Give me a mail and i will send the workbook and explanation. We thank you very much for actively sharing your excellent knowledge with us at no cost. Your posts are very informative and they simplify our works for us. Speaking for the majority, I know. Have a good holiday and see you in the coming year. These are truly helpful and so appreciative tutorials. The tutorial provided on ‘Excel Dynamic Chart with Drop down List’ is very powerful for displaying data, but when used with a pie chart, the values that have zero, or are empty cells, still appears on the pie chart. Is there anyway you can help in not having those values show in the pie chart or any other graph, if they have a blank cell or zero value? I tried integrating you lesson on ‘Automatically skip blanks in Excel charts with formulas’ into the dynamic chart with drop down, but became very confused in doing so. Thanks again. I’d go with a data preparation table in this case and use that as the source for the Pie Chart. So right beside the values you can put this data prep table. If you download the workbook for the formula version of the “Automatically skip blanks” lecture, you can copy and paste the formula from my file to yours. Would that work? i just started to use some of the formulas in Excel for the first time, and I came across you discussing the “IF” function. you explained it very well so, I looked for your other topics. Like your videos a lot, and tried to download video source above, and i cannot search it, scroll through it or use it in any way. Cannot see beyond row 40 when scrolling down. Probably just me, but wondered if that has happened to anyone else. 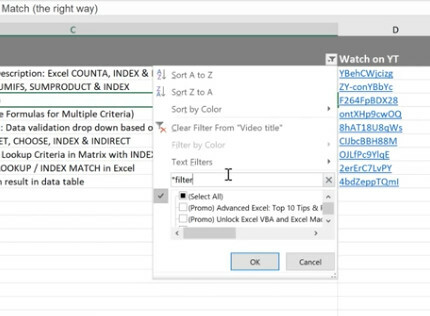 Hi Jim – if you have Excel, you should be able to scroll and use it. It might be in “protected” form when you open it so you might need to click on “enable editing” on top of the workbook. I want to say a big thank you for staying put and giving time to continuous learning. Your videos have sure giving a sit at the table at my work place and has fanned me to relevance. I would like to know the requirement for registering as your student. Thank you for your question. To aid in answering your question, the following link to the Microsoft Excel Tech Community would be the best place to pose your question. If you have a sample file to upload, this would greatly aid in developing a course of action. The Excel Tech Community has some of the finest minds in the industry. No matter your issue, I’m certain someone there can inform you of the best way to reach your solution. With over 25K members and almost 30K posts, your solution is either ready and waiting or has the possibility of being answered more quickly than we may be able. Thank you for taking the time to write. I hope you find success with this fantastic group of Excel enthusiasts. You have been a great instructor and your YouTube Videos are really helpful. I am planning to take a course on Dashboard so that after learning it, it can be useful for my work. I would appreciate a series on Building Management using MS Excel or possibly even more Office 365 suite applications that help control cost such as monthly versus budget spending considering budget WBS, physical time control, quality, scope, purchasing , human resources, risk, integration and communication and dynamically summarizing in a dynamic dashboard which will be updated monthly. Consider a dashboard field for comments or alerts from the project manager. Also consider the applicable CPI, SPI or other KPI indicators. The idea is to present the monthly report such as “one page report”. From now I am aggrading your wonderful didactics and attention to those who wish to greatly evolve their learning in MS Excel. This week I will sign up for the 3 Course Bundle. PS: I wrote in Portuguese from Brazil and I used Google translator, so I’m sorry if any words or meaning of the phrase caused a misunderstanding. Thank you Ricardo for your suggestions. I’ve added them all to my list. I will check which one I can incorporate in existing or future courses & videos. Many thanks for your support.